Categorized as: Stories on January 18, 2014. A stressed, angry wife struggling to support a seriously ill husband and three children figures out a way to mechanize her output and produce four times as much merchandise in four hours a day. Now she’s rebuilding her home, and employing three high-school kids. Her savings through the group circumvented a second family health crisis, because she had money in the bank to cover it when she needed kidney surgery. Part 2 in our 5-part series from Peru. 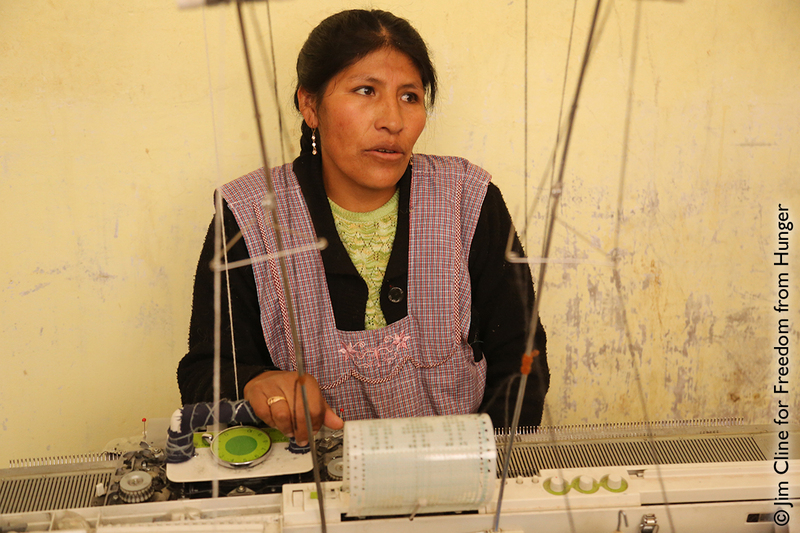 Cover photograph: Sonia weaves on the machine her microloan enabled her to purchase. She’s quadrupled her output and hired three teenagers. Daughter Katya is proud of her mom but has other career plans. Photograph by Jim Cline for Freedom from Hunger. Sonia works at her machine loom; teenage daughter Katya holds some woven finished products. 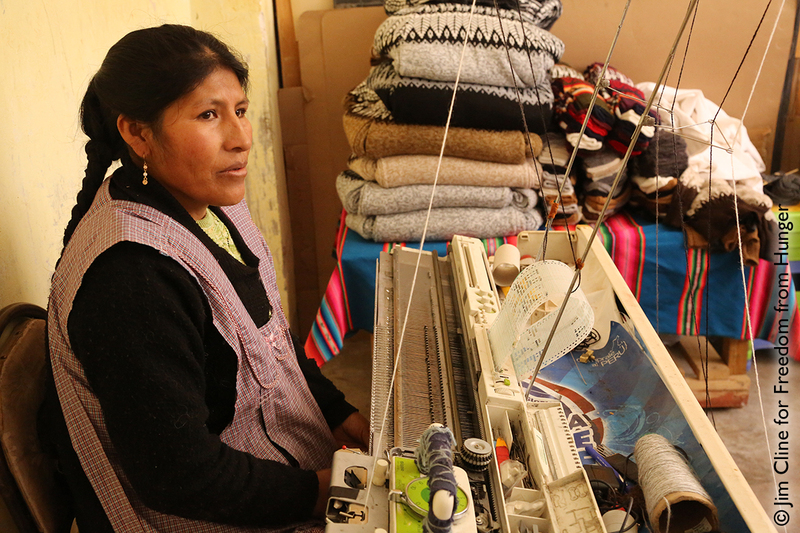 Ernesto’s illness prompted Sonia to join her local credit group and take out a loan to purchase a machine loom. 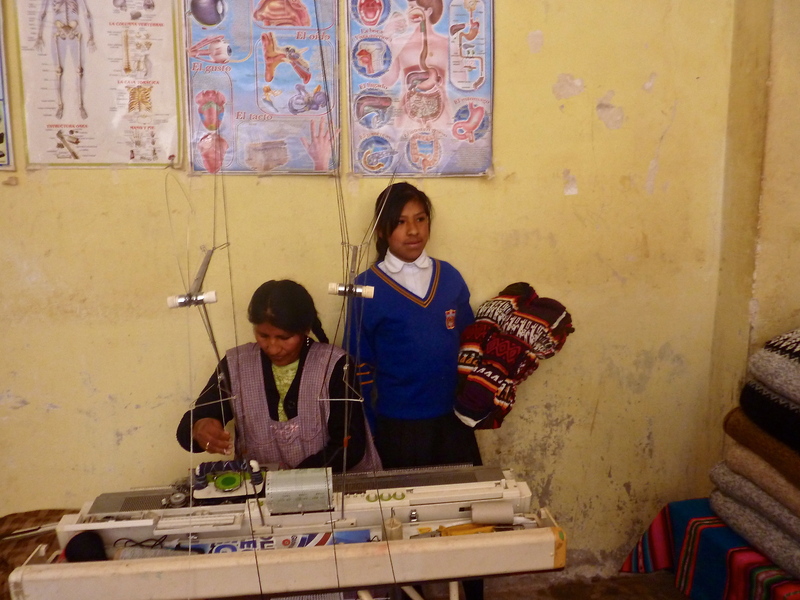 Now five years later, she owns two machine looms and hires three employees to keep them clacking along, producing gloves, hats, scarves, leg warmers, and blankets, to keep both residents and tourists alike toasty warm in the high-altitude frost of the Andes Mountains. Not only does she staff a booth at the local Juliaca markets on Sunday at 2a.m. and Monday at 4a.m., Sonia sends goods to such larger cities as Tacna, Lima, Cusco, and over the border into Bolivia. Although Sonia still uses the handspun wool yarns and ancient geometric patterns from her Andean heritage, she now can install a pattern stencil and run the shuttle back and forth to produce in four hours what used to take all day. Sonia knew that she would be backed by her credit group so that she could take a microloan to build her business inventory. However, she couldn’t have foreseen how much her income increase would impact her family. She also didn’t know she’d step in to a leadership position as a mentor to local youth. “My own kids are too small” to help, Sonia says, so she has three high-school students come in the afternoons to take shifts on the looms. 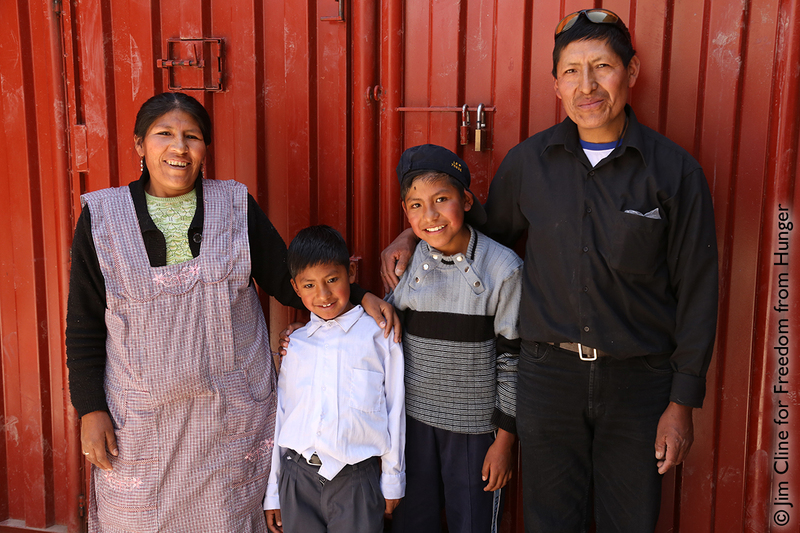 Sonia’s salary has enabled the family to improve their formerly “basic” home: “We built walls, put in doors, brought in furniture, and bought a TV.” Sonia’s workroom occupies a large, airy first-floor room with butter-yellow painted walls. Posters from her credit group on human anatomy and health decorate the wall behind her loom, and tables laden with carefully folded garments await only this weekend’s sales. Ernesto, who works three jobs, stops in for lunch and greets Sonia. His day begins at 7a.m. 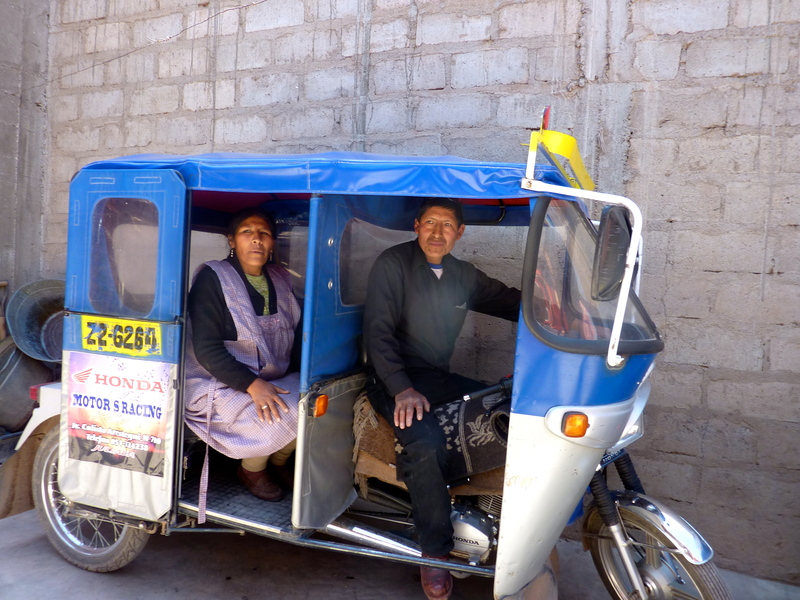 as a taxi driver—they now own two motokars, or three-wheeled motorcycle carts. Along the way he makes deliveries of Cola Real beverages to local businesses. He’ll have lunch at home, then sleep this afternoon before going to his night shift as a security officer. He agrees that his wife’s loan has been “more or less a support for the family.” He points out that his salary is higher, but that with Sonia’s income, “We can buy materials [for the business]. Her money is always an extra support for the food and the children.” Currently, Sonia has a housing loan they’re using to install a new floor and a garage. Sonia poses as a customer in Ernesto’s three-wheel moto-taxi. Sonia also could not have foreseen how much the community of her group would come to be a resource she would rely on. “I joined my [credit] group to get out of my stress, and I needed them,” she recalls. “We have seventeen members.“ Most members, like Sonia, run handicrafts microbusinesses; a few sell such food products as quinoa and pineapple juice from carts in the street. One member is a woman taxi driver—a sight rarely seen outside of the capital city of Lima. Not only has Sonia progressed from stressed home-handicraft mom to small-business employer, she also founded her current credit group and serves as its president. “ADRA is the best one of all the banks,” she laughs, “because they have savings. And we get surprises” when members meet their business and loan goals, she adds. The next time someone in her family fell ill, it was Sonia’s turn: She needed kidney surgery, and the $325 she had saved through ADRA covered her expenses without straining the family. As Sonia and Ernesto talk over the steady clicking of her loom, Sonia’s hands flying fast, maneuvering the shuttle back and forth, their children begin to gather for lunch. Here in Peru, the public schools are so crowded that the elementary kids attend in the mornings and secondary kids take a turn in the afternoons. Eight-year-old Eddy wants to be a doctor when he grows up, and ten-year-old Miguel, who already can win any argument, wants to be a lawyer. Their daughter Katya hugs her mom and stands nearby, watching the loom, mesmerized, as her mother works. She’s just finished her homework and, dressed in her school uniform, is about to leave for afternoon classes. She is thirteen. Her dream is to be a policewoman when she grows up, and her parents see absolutely nothing standing in her way. “Her life will be nothing like mine,” Sonia says emphatically. “She will have the opportunity to go to college, and she may have the opportunity to know several countries.” The two younger boys have set down their backpacks and are running around the driveway, laughing and playing fetch with the little family dog. Katya gathers her things and prepares to leave for class. Sonia and her family in front of the locked gate that secures their home and vehicles: future doctor Eddy, future lawyer Miguel, and three-job juggler dad Ernesto. Ernesto predicts Katya will be a “professional” woman. He thinks she’ll complete college and then move to Lima to work with her grandmother in an exports business. “Whatever she chooses,” Ernesto says as he puts his arms around both Sonia and Katya, “She will be able to go many places.” His own hard work, and the ingenuity and success of his wife, have paved Katya’s way.